Of our five senses, humans rely on vision most strongly. Our everyday experience of the world is colored by our ability to see, our memory draws heavily upon visual information, and many activities of daily living are challenging without sight. As a result, it is essential to protect your eyes from damage. Regular visits to an eye care provider allow you to receive a professional eye exam that checks for damage due to inadequate eye protection. Americans are spending more time than ever in front of screens. From checking email on smartphones to staring at a computer screen in your office to watching TV in the evenings, too much screen use can cause eye strain. Experts recommend taking at least five minutes per hour to relax your eyes and alleviate strain. Go for a brief walk or focus on distant objects to reduce eye strain before returning to the task at hand. It is easy for eyes to become damaged by windy conditions, blowing dust, air pollutants, and other small particles in the air. 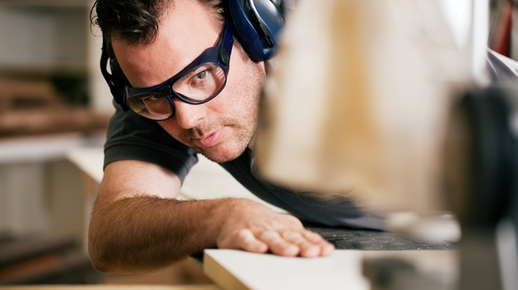 When facing dusty or windy conditions, eye drops or safety glasses can protect your eyes from damage. Contact wearers should opt for glasses to prevent particles from irritating the surface of your eyes. Whenever possible, stay indoors on very windy or dusty days to prevent eye damage. If your eyes become very irritated, visit the eye doctor for a thorough optometry exam and treatment recommendations. Everyone knows that UV rays cause sunburns, but did you know that UV exposure damages your eye tissue as well? Lengthy, intense exposure to UV rays may increase your risk of macular degeneration, cataracts, and other eye conditions that affect your vision. To stay safe, find a pair of sunglasses that block 100% of UVA and UVB rays. Darker lenses or more expensive styles do not always translate to better UV protection. When possible, choose wrap-around styles that do not let light in from the side. Sunglasses are not just for summertime or bright days -- UV damage can occur year-round and can be especially bad during the wintertime when sunlight reflects off of ice and snow. In general, the best policy is to avoid taking chances with your eye health. Wear proper protection when heading outside, playing sports, and working with dangerous tools or chemicals. Your eyes are designed to last a lifetime; treat them well, and you can avoid major vision problems that affect everyday life.